The early concession of three unanswered tries in the first 20 minutes left Greystones with a mountain to climb once again and despite tries by Andy Roberts, Andrew Kealy and Bobby Clancy we were to come away from Nenagh empty handed. Kevin Lewis will be looking to the squad to bounce back this Saturday at home vs Highfield and is appealing to the members to come out in force to support the team. 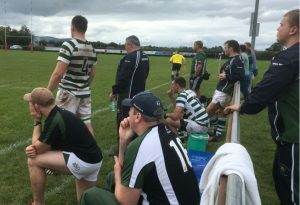 Three late tries by Blackrock overturned a 15 – 12 lead mid way through the second half in a disappointing defeat for the seconds in Metro Div 2. In a echo of the first teams performances the thirds went behind to early tries gifted to Barnhall before battling back to within a score at the end to earn a losing bonus point. A first league outing for this young side fused with experience that promises much more.